GO FAIR offers an open and inclusive ecosystem for individuals, institutions and organisations committed to defining and creating materials and tools as elements of the Internet of FAIR Data and Services. Organised in GO FAIR Implementation Networks, motivated early movers can commence with crucial activities. 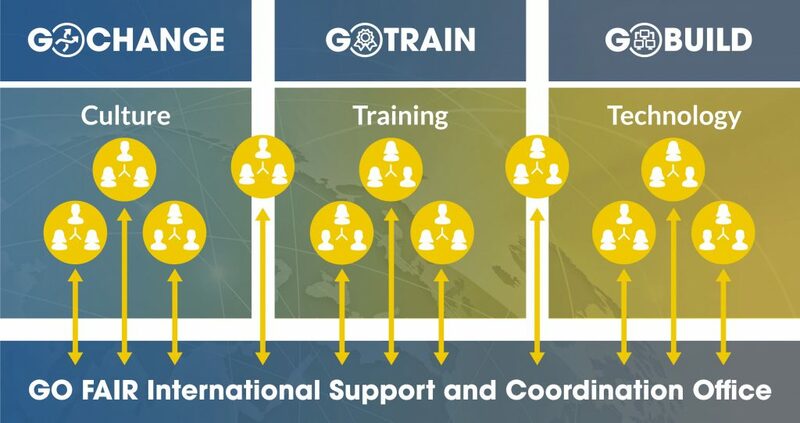 At any time, new Implementation Networks can be joined or added and as such the GO FAIR Initiative is entirely open, inclusive and stakeholder driven. designing and building the technical standards, best practices and infrastructure components needed to create the Internet of Fair Data and Services (IFDS) (GO BUILD). Inspired by the ‘hourglass architecture‘ underpinning the success of the current internet, GO FAIR relies on just enough coordination and international guidance to prevent silo formation, undue competition and fragmentation. Apart from that, it is regarded as critical that within each of the three pillars in GO FAIR and within each participating country or organisation, optimal ‘freedom to operate’ must be safeguarded.